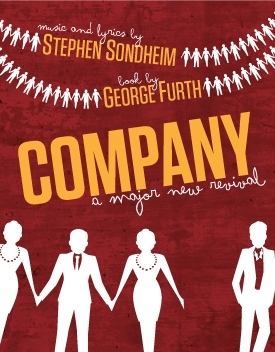 Marking the first ever musical to play at the Southwark Playhouse, Stephen Sondheim’s Company is one of the few shows that didn’t receive an airing in London last year (aside from the Donmar concert version) but receives a fringe production here from Mokitagrit, who are riding high on the recent success of Double Falsehood which is now transferring to the New Players Theatre for a brief extended run. It contains some of Sondheim’s greatest songs, but with its tricksy structure and book by George Furth, I have found it a difficult show to love. The story centres on eternal singleton Bobby who is just about to turn 35. He is juggling three girlfriends and the 5 sets of married couples that make up his best friends are keen for him to settle down, but as the show progresses through a series of vignettes that look at each couple in turn, we see that each couple has their own story, their own take on marriage and their exhortations for Bobby to give up his bachelorhood masks issues in their own lives. The standout of the night is Cassidy Janson’s Amy who delivers the rapid-fire patter of ‘Not Getting Married Today’ with superb comic feeling and the kind of precision that reminds you that she really is one of the most exciting musical theatre actresses we have. And with Greg Castiglioni’s compassionate Paul, make for a most engaging, gorgeous-sounding couple. Siobhan McCarthy is a rather astringent Joanne, punching out a powerful ‘Ladies Who Lunch’, Leigh MacDonald’s Sarah and Matthew White’s Harry were well-matched in their karate tumbles and I enjoyed Steven Serlin’s David and Adam Venus’ sexually curious Peter. But it is Katie Brayben who comes closest to stealing the show as one of Bobby’s single friends April with a genuinely funny dumb blonde routine and one third of a brilliantly perky ‘You Could Drive A Person Crazy’. At the centre of it all is Rupert Young’s Bobby, played here as perhaps more troubled than usual, already uncertain, already unravelled, a more realistic portrayal of a man in crisis but simultaneously a somewhat less sympathetic one too. At times, it made his Bobby feel like a friend who is tolerated more than loved, an unexpected effect that makes it hard to see why his friends care so much about him and harder for the audience to root for him at the end with an admittedly stirring rendition of ‘Being Alive’. There is strong chorus work from everyone, I liked the spreading of the cast to the four corners of the auditorium which spread the sound nicely (plus it meant we had Cassidy Janson singing right next to us, a lot! *swoons*) and there was some nifty choreography from Sam Spencer-Lane which really makes the most of this ensemble who really shine in the opening numbers to both acts. But a slight muddiness to the sound meant that there wasn’t always the necessary clarity to do the lyrics full justice: everything, sound, singing, line delivery needs to be that little bit sharper to really fly. This still remains an accomplished production though and there’s always a pleasure in seeing and hearing West-End quality musical casts up close and personal. I still remain to be convinced by the greatness of the actual show though, but part of this largely down to the way in which Sondheim came to be part of my musical life. I had two Sondheim compilation cassettes as a boy and so I came to love the songs as I heard them here (I long for the day I finally get to see Bernadette Peters live) stripped of their context. It is only a few years ago that I first saw a Sondheim show in its entirety and it was a weird experience seeing the songs I knew so well in such a different way and I am still struggling to shake much of that off (or else I should just stick to revues!). Booking until 12th March. Early booking is recommended as the airline style pricing means you can get a steal on tickets if you move quickly. Great review. but, just one thing….Steven Serlin's character, David, ISN'T the sexually curious one! Thanks for the tip. 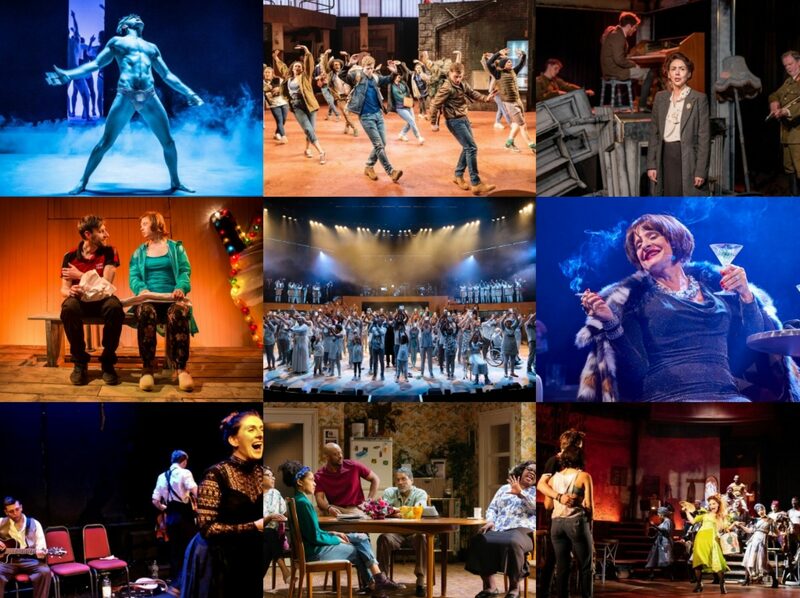 Have you seen/will you be going to the show, it does seem to be very popular.